Fourteen lakh cups made of dry leaves, or dronas as they are called, are stacked in the store room of the ISKCON temple in Juhu, waiting to receive the delectable ‘halwa prasad’ that is bubbling in huge cauldrons in the kitchen. 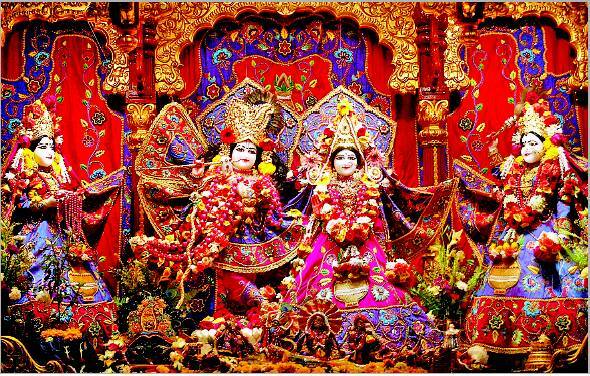 One of the largest gatherings in the world on Janmashtami will unfold at this signature Krishna temple where up to 14 lakh devotees converge to pray over two days. The time for an appearance of the Lord coincided with two internal desires of the Supreme Personality of Godhead. First the Lord desired to descend on earth to increase the fortune of Yasoda and Nanda. Also at that time Krishna wanted to relish the sweet mellow of smgara rasa (paramour love) while enacting His worldly pastimes. For these two reasons the Lord appeared within the material creation on Bhuloka, (earth planet), along with His parents, friends, and other eternal associates.